Pesticide spraying may hold the key to an unsolved mystery involving the collapse of hundreds of children more than 20 years ago. 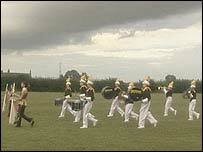 In July 1980, almost 300 children who were competing in a brass band competition in a field near Kirkby-in-Ashfield, Nottinghamshire, were hit by vomiting, runny noses and sore eyes. The cause of the children's symptoms was never pinpointed, however health authorities at the time suggested it was a result of mass hysteria. But an investigation by BBC's Inside Out documentary team has discovered that the pesticide tridemorph - which was sprayed near the fields at the time of the incident but later banned in 2000 - may have caused the reaction. Terry Bingham, an eyewitness to the incident, said: "We knew something was wrong when we children started fainting and dropping. "But I don't think it was mass hysteria that caused it - I still think it was insecticides." 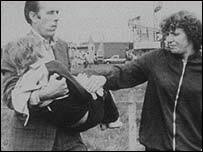 On that Sunday 23 years ago, children from across the Midlands collapsed at the Hollinwell showground about 10 miles north of Nottingham. Most of the victims were taken to nearby hospitals, but only nine were kept in hospital overnight. Steve Mitchell, an ambulance worker who responded to an emergency call, said: "There were a lot of young people very distressed - their eyes were very sore and had severe breathing difficulties - there was a smell in the air. "With the bands marching up and down, they were dispersing the chemical into the air - and I am sure it was inhaled by the young children." A study into the use of the chemical pesticide tridemorph later revealed it could be harmful, causing several side effects in humans, including irritation to the eyes and skin. Another eyewitness Margaret Palethorpe said: "They collapsed and were unconscious - we put them in the recovery position and got help. "It hit grown-ups, children and babies, but there was no explanation for it." Ashfield District Council, which investigated the incident, has said it has no plans to reopen the inquiry. The investigation in 1980 revealed that a pesticide Calixin, which contains tridemorph, was sprayed on fields in the area in the week leading up to the event, but it was not considered harmful at the time. The official explanation for the fainting incident is still mass hysteria, although other causes such as nerve gas, contaminated water, radio waves and food poisoning were also considered.